So we are going to make things as simple as possible for our final price trading session of the week, and narrow our range right in to something like a fifteen dollar split. This gives us the chance to take advantage of any tight movement as we head into the weekend. Why are we doing this? Well, those reading will likely be aware of the action seen across the last few days, and the impact this has had on what we are now looking at as a potential upside price ceiling. However, this said, price has corrected pretty sharply on a couple of occasions post-gains, and so to bank on us seeing a third round of sustained gains (and in turn, us being able to ride it out to an upside profit) is a bit risky. By bringing things in to a tight range like this, we can manage our risk a bit more securely. So, as we head into this evening’s session and beyond, what are the levels we are focusing on? Take a look at the chart below to get an idea of both this afternoon/evening’s range, and the levels at which we aim to get in and out of the markets on any volatility. As ever, it’s a fifteen-minute candlestick chart. As the chart shows, the range in focus for the weekend is defined by in term support to the downside at 737 and in term resistance to the upside at 754. Intrarange is on, so long at support and short at resistance. 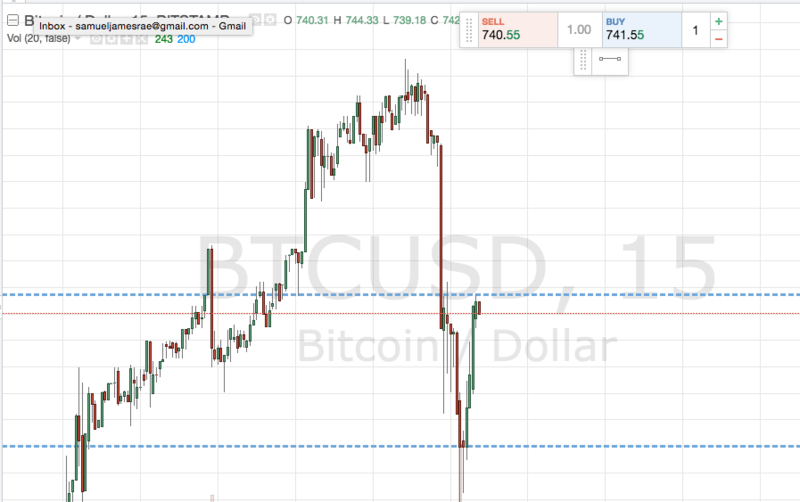 On a breakout entry, a close above resistance signals long towards an initial upside target of 765. Stop loss at 749 flat. Looking short, an entry on a close below support targeting 730, with a stop loss at 742, is a valid bearish trade.